We’re excited to debut the first veal recipe on OrganicMeatsandVeggies.com! Passanante’s Home Food Service is best known for the convenience of our home food delivery service, which brings delicious, high-quality foods right to your door so you can easily prepare healthy meals at home. While day to day meal ingredients are our bread and butter, we also offer spectacular specialty foods including a wide assortment of seafood, hearty bison, and of course – delicate veal. This recipe for Veal Piccata makes for a beautiful presentation, perfect for a special occasion meal enjoyed in the comfort of your own home! 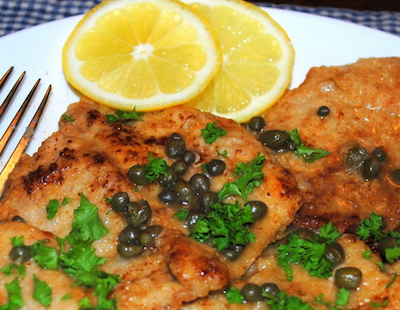 Pour sauce over veal, garnish with lemon slices and capers & ENJOY! This entry was posted in Beef, Recipes and tagged Gourmet Food Delivery Service, Passanante's Home Food Service, Recipe, Veal Piccata by Passanante's Home Food Service. Bookmark the permalink.